Is a very broad stock index suggesting that a top is in play? What this index does to close this week should go a long way to answering that question! This chart looks at the NYSE Index on a weekly basis over the past 4-years. Over the past 15-months, it has created a series of lower highs and lower lows inside of the shaded falling channel. It hit strong support around Christmas at (1) and a counter-trend rally started. The rally now has it testing the top of the falling channel at (2). 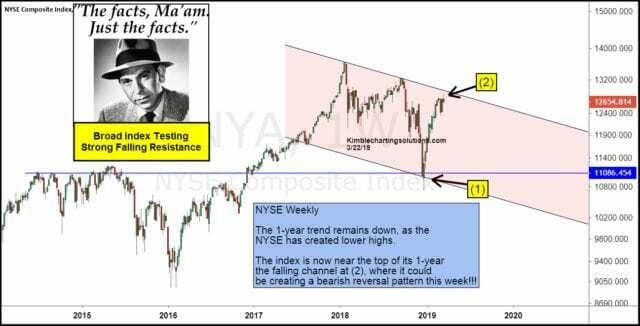 Joe Friday Just The Facts Ma’am- The NYSE index could be creating a bearish reversal pattern (bearish wick) at the top of the falling channel at (2). If the NYSE turns weak at this key resistance point, it would be hinting that an important top in the market is in play.